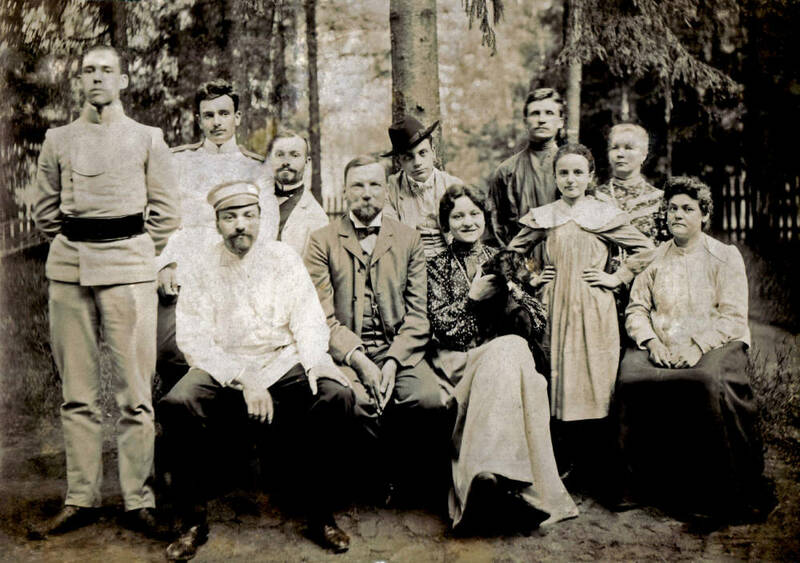 This is a family of my ancestors, my great-grandfather Friedrich Napoleon Koenemann (June 27, 1838 - March 23, 1903) and his wife, my great-grandmother Olga Ivanovna Gnedich (1849-1925), sitting first from right. They had 14 children, five of them are shown at this photo. The picture was taken at the family datcha in Tayninka near Moscow, Russia circa 1910. More about Koenemann family available at the website www.keneman.com about Russian composer Feodor Feodorovich Koenemann (1873-1937), and at the Koenemann family tree at http://www.keneman.com/Keneman/Koenemann-Genealogy.html.